Holistic Quality of Life Assessment-How? Geriatric care managers and aging professionals who want to advance the holistic quality of life for their clients can make a measurable, long lasting impact on overall health and well being if they zero in on quality of life. An articled in the The Advanced Journal of Nursing found that choice, privacy and a sense of identity made all the difference in the quality of life of residents living in residential care. This showed, according to lead author ” the importance of providing a holistic, person-centered approach that goes beyond satisfying the technical and procedural aspects of care” Finding activities that help elders grow and nurture their emotional, intellectual, physical, and/or spiritual quality of life can help to nurture an older persons whole life and bring back joy. For example, look at this you tube on an older woman who reconnected with art, which is her talent and spirituality and younger people plus her family, through a quality of life assessment. A just released stuffy by the Pew Family Trust on Care, Pew Internet Project and supported by funding from the California HealthCare Foundation found a fact professional ‘s working with seniors already know – almost a third of us are family caregivers. That includes midlife siblings, and wives. The much anticipated study found the 30% of US adults are caregivers. Plus the study confirmed another fact that caregivers and aging families know but is now substantiated. Technology and the Internet is a key tool that sibling and more often spouse caregivers use to render care to aging family members. • have a laptop computer (55% vs. 51%). Are you a family, sibling or spousal caregiver and use technology? Check out this report. 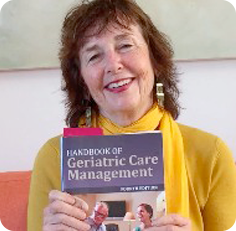 If you are a aging professional, this is important information on how to reach your potential clients.Professional geriatric care managers should check out Julia Menack’s Technology to Support Aging In Place in the third edition of Handbook of Geriatric Care Management 2011.